As the lead singer of one of the hottest bands to hit the rock scene, f*cks are free, drugs come easy, and music is life. For as long as Stone can remember, Willow has been his music – the notes that weave his soul together. His rhythm. All he has left is a handful of pills and a few lines of powder to make him forget her. And he tries, over and over. Review: This was a free download and I had low expectations. I'm happy to say that I enjoyed this one! 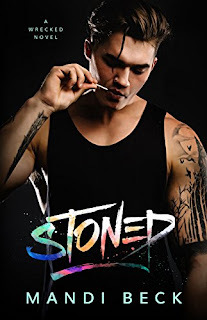 Stoned is about Stone Lockhart, a successful and famous musician and his long-time girlfriend, Willow. Together since high school, Willow has stayed by his side despite his downward spiral into drugs and constant cheating. When the book starts, she has finally reached her breaking point and leaves while Stone is in the middle of a tour. When he's done touring, he needs to get his life straight and try to win her back. Yes, Willow was a doormat for years so it's hard to think of her as a 'victim' in their whole relationship. But I liked how she tried to move forward with her life and even though there was extremely cheesy language, I thought this was a good romance. I wish there was more 'sexiness' but I will definitely read the next in the series.